Next in line within our series of articles on email marketing is the principle of liking. Liking, a social psychological tool, says that users are persuaded and influenced by those they know or like. For example, it’s found that a user is much more likely to be interested in a company, product, or service if the salesperson, or spokesperson, is someone the user is close to, fond of, or drawn to. When applied to email, this principle can form the foundation of an extremely persuasive campaign. If you haven’t read the previous articles within this series and want more context on where liking came from, we suggest starting back at article one. We say “yes” to individuals we know or like. Follow along as we cover everything you need to know about liking including what liking is, the proof behind this principle, three strong example of liking within emails, and finally, how you can apply liking to your email campaigns. The principle of liking says that users are drawn to and persuaded by individuals they know or like. One of the best examples of this principle is sales. When you think about it, the principle of liking is at the core of all sales. For instance, when you go to buy something, whether it be a sweater at the mall or a new home for you and your family, you’re often greeted by an overly-enthusiastic salesperson. Typically, companies strive to hire friendly, likeable, and often attractive salespeople. This is because large corporations are aware of the impact the principle of liking has over their customers. Similarity: We like people who like us. Familiarity: We like people we are familiar with. Cooperation: We like people we collaborate with. Association: We like people who connect themselves to positive things. The secondary principles of liking will help you better understand this principle of persuasion. As we dive into the email examples of liking later within this article, we’ll touch on how these secondary principles play a role in producing persuasive email designs. Now that we’ve reviewed the principle of liking from a high-level, we’ll move onto the next section, which will cover the proof of this principle. Here, we’ll review one of the most prominent and noteworthy studies on the principle of liking, the Tupperware party study. The Tupperware party study was conducted by two consumer researchers, Frenzer and Davis. Together, they observed the social ties between the hostess and partygoers at Tupperware parties. Dr. Robert Cialdini, developer of the six principles of persuasion, referred to this study as the quintessential American compliance study. For those who are unaware, a Tupperware party consists of the following: A hostess phones her friends and family, informing them that she’s throwing a party in which Tupperware, plastic storage containers, will be sold. At the party, salespeople from Tupperware will attend. These salespeople are responsible for demonstrating and selling the products, not the hostess. The party consists of countless demonstrations, giveaways, and socializing. At the end of the night, the party hostess will take home a profit from each Tupperware sold. Typically, most guests are aware that the hostess will profit from the sales. When observing these social scenarios, what Frenzer and Davis found was surprising. Although the salespeople were the individuals pushing the product, taking the orders, and asking for payment, they found that the salespeople weren’t the ones responsible for inflicting persuasion onto the partygoers. Rather, the psychological compeller was the party hostess—the one that wasn’t demonstrating the products, but rather dishing out horderves and cocktails to her guests. The hostess was the compelling influencer in these scenarios due to the principle of liking. The principle of liking says that users are much more likely to say “yes” to those they know and like. The hostess, the one who invited them to the party, and the one who is gaining a profit from the sales, is someone they’re familiar with and like. This is why Tupperware parties are so effective. By providing the hostess with a percentage of the sales, Tupperware created a way for their customers to purchase products from a friend, the hostess, rather than a stranger, the salesperson. In fact, this tactic was so successful that Frenzer and Davis found that partygoers were twice as likely to purchase a Tupperware product when their friend was the one hosting the party. Thus, the power behind the principle of liking. After discussing what liking is and how the principle has been proven, we’ll move onto the support. The support featured within this section includes three different email examples that make use of liking. This email entices the user through the principle of persuasion, liking. 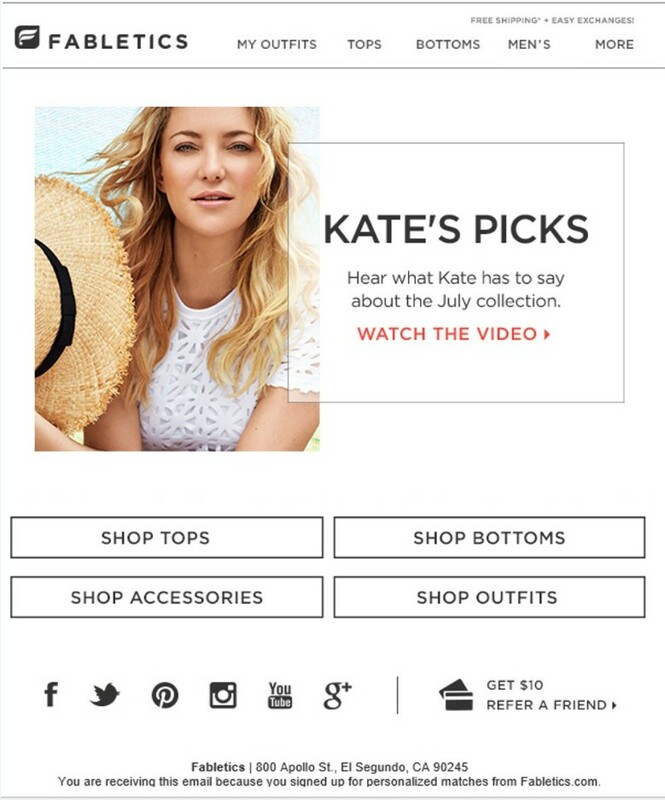 Based on this principle, the user will feel influenced to purchase the recommended products because Kate Hudson is a highly likeable and extremely well-known voice for Fabletics. We know this is effective because based on the principle of liking, users are more likely to say “yes” to those they know or like, i.e. Kate Hudson. As co-founder, Kate Hudson is an ideal social influencer for Fabletics because she’s fit, attractive, and energetic—characteristics of Fabletics’ brand. However, often, you’ll notice many companies wrongfully choose social influencers that aren’t appropriate for their company. Some companies will select influencers that have nothing to do with their products or what they’re trying to achieve from a brand perspective. Featuring influencers that have no correlation to your brand ultimately creates an ineffective and unsuccessful campaign. At Zion & Zion, a digital marketing agency, we recommend staying away from social influencers that seem appealing solely due to the fact that they’re in the lime light. Rather, think strategically about your partnership selections and choose an influencer that’s relevant, well known, and likeable by your target audience. Featuring a social influencer that resonates with your audience within your emails will increase the persuasive elements of the campaign as well as increase the use of liking. In the previous example, we took a look at how you can leverage liking with a social influencer or sponsor. However, there are plenty of other ways to entice your users without the use of a sponsor through likeable groups, images, and content. We’ll take a look at the below email, which is an email done by Toms. To give you some background information, it’s important to note that Toms is a shoe company. Their mission is to supply resources and supplies to individuals in third-world countries. 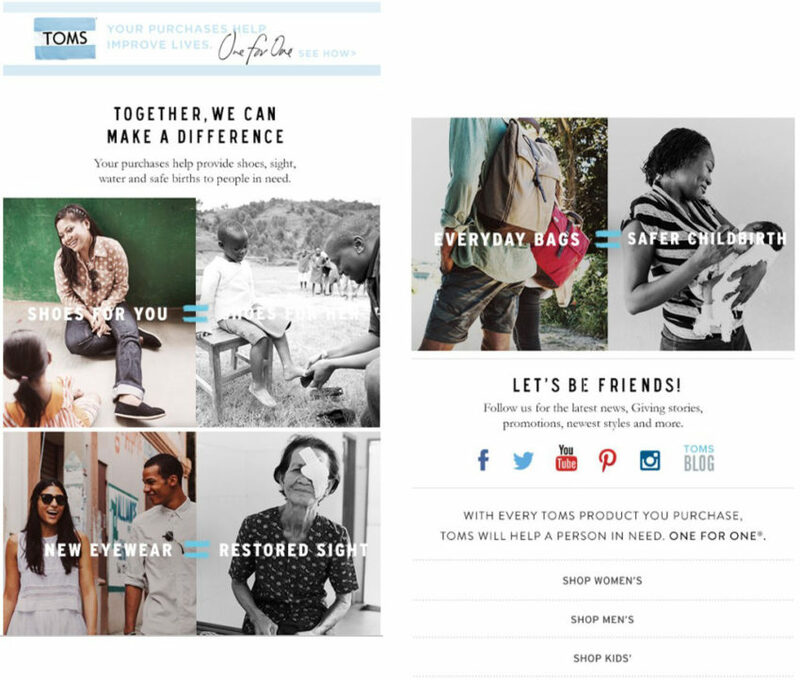 The company advertises that when you purchase shoes from their company, you’re helping provide shoes, water, and safe births to individuals in need. In this specific email Toms used the principle of liking throughout most elements of the email. For example, when opening this particular email, the first thing the user will see is a headline that reads, “Together, we can make a difference.” This headline leverages cooperation, a secondary principle of liking. Cooperation says that users like people they collaborate with. By mentioning “Together, we can make a difference,” the email is pulling the user in, asking them to join in, or collaborate, with their mission. Moving down the email, the next element the user will see is imagery. However, the images featured within this email are not your typical iStock images. Rather, they’re images of real customers, helping real individuals who are in need. These images are tangible, warm, and genuine, which amplifies the principle of liking. Additionally, these images make use of association, one of the secondary principles of liking. Association says that users like people, or companies, who connect themselves to positive things. The imagery pictures individuals performing positive favors to those who need it, which helps instill the principle of liking even more. Finally, the last element we’d like to point out is the copy located at the bottom of this email. This copy reads, “Let’s be friends!” This verbiage is making use of familiarity, a secondary principle of liking, which states that users like people they know. When Toms invites the user to be friends with them, they’re really asking the user to become familiar with their company and their mission. Like the other elements featured in this email, this copy works to persuade the user, ultimately creating an extremely successful and persuasive campaign. The final example of liking is from Topgolf. If you’re not familiar, Topgolf is a company that provides an indoor/outdoor golfing experience, similar to the experience one would enjoy at a bowling alley. The service is popular for families and individuals who enjoy sports. Within the featured email below, Topgolf leverages liking through its secondary principle, familiarity. 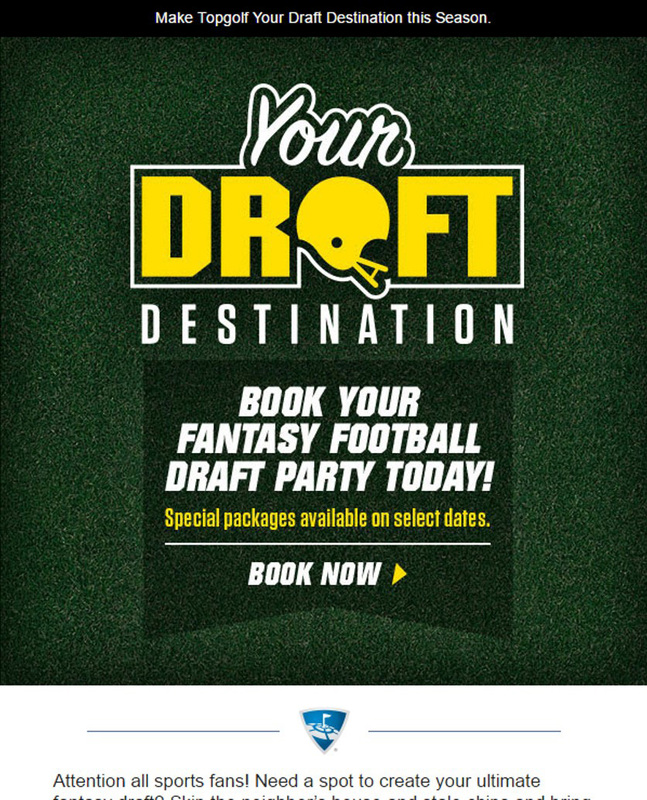 You see, this email is sent out so that the targeted users associate Topgolf with fantasy football. This was strategic not just because fantasy football is a popular event, but because those who are interested in fantasy football are also (most likely) interested in visiting a Topgolf location. This is because the two companies share a similar target audience. The main takeaway from this example is to make sure you’re putting thought into the companies, brands, and individuals you’re associating your brand with. When doing so, we recommend connecting your brand to something your users resonate with to leverage the principle of liking. When applying the principle of liking to your email marketing / marketing automation campaigns, make sure you keep your target audience in mind. Don’t solely select images, content, or spokespeople based on the fact that they’re popular or likeable to a wide range of users. Instead, take the time and test your featured elements to ensure that your target audience views the imagery, verbiage, and graphics as likeable. After doing so, you’ll be one step close to creating an effective and persuasive email campaign. Don’t forget to read the next article within this series, which will focus on the fifth principle of persuasion, authority. There, we’ll teach you how to incorporate authoritative figures, graphics, and content into your emails in order to capture your user’s attention and loyalty.